The definitive one-stop guide to selecting and using all types ofelectronic components, including. 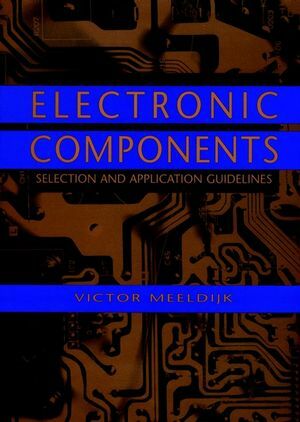 Electronic Components is the essential sourcebook for electronicsengineers and technicians, sales staff, marketing personnel, andother electronics professionals. It incorporates a vast amount ofcurrent information and data from thousands of catalogs, referencebooks, textbooks, newsletters, trade papers, and journals. Theinformation is organized logically and cross-referenced to provideeasy access to crucial component specifications and instructions.Clear, direct presentations make even complex technical informationcomprehensible for nontechnical professionals as well as for thosewith electronics backgrounds. This remarkably detailed guide helps electronics professionalsunderstand the many types of devices currently available,streamline the component selection process, avoid component over-and under-specification problems, understand device parameters, andreduce costs. Victor Meeldijk has been involved in the electronics field for 20 years. Currently he is the Reliability/Maintainability and Component Standards Manager at Diagnostic/Retrieval Systems, Inc. in Oakland, New Jersey. Chokes, Coils, Inductors, and Transformers. Sources of Information, Specifications, and Parts.